We're only one month into ownership of our Ford Fiesta ST, and already there's plenty to talk about. Where to start? How about the main ingredient: that engine. Most non-ST Fiestas come with fun, strong Ecoboost motors, so discovering that our car's 200hp 1.5-litre triple feels more potent than its specs suggest has come as no great surprise. What has impressed us is the breadth of performance the new powerplant offers, and how much of a step forward it has taken over the previous 1.6-litre four-pot. Despite giving up 100cc and a cylinder to its predecessor, the new ST feels more eager more of the time. It masks its reliance on turbocharging well, being quick to respond and surprisingly keen from low down in the rev band. 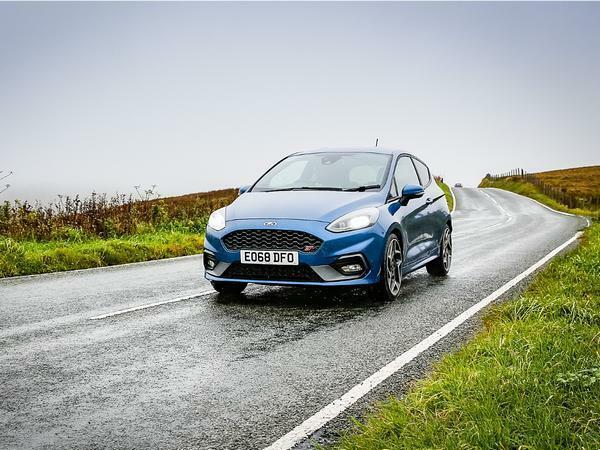 Yes, this was true of the previous ST, but both factors have been noticeably improved, and make the new ST feel at least as quick in most real-life driving scenarios as hot hatches in the class above. Proof? 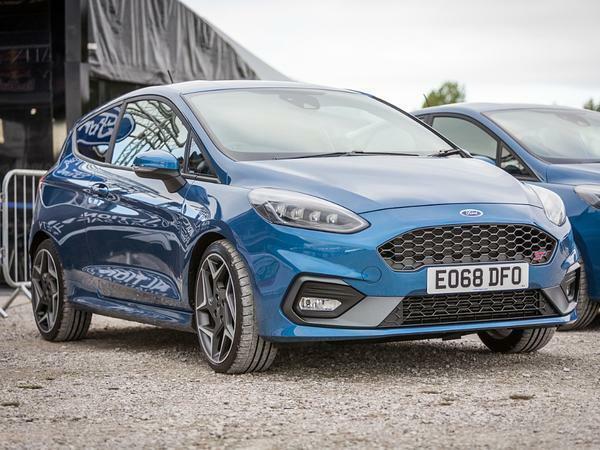 To yours truly, the Fiesta motor's enthusiasm to spin up means it's actually been a more effortless car to drive on the daily commute than our recently departed Hyundai i30 N, which had a 75hp advantage from a significantly larger engine. We'd bet that if second gear was a little leggier (negating an upshift to third), the Fiesta ST would be a tenth or two quicker to 62mph. 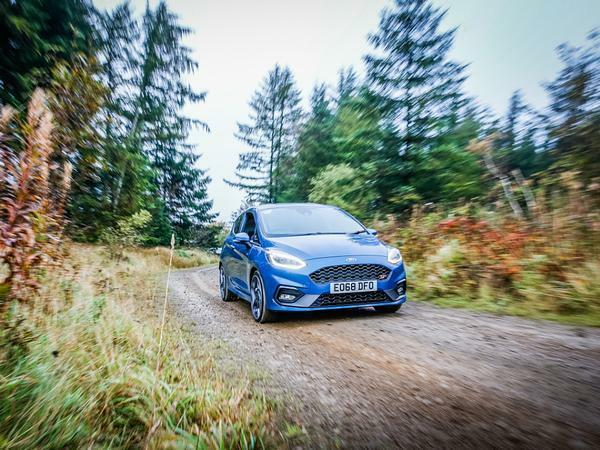 Previous experience of Ecoboost engines suggests our triple's best is yet to come as the miles pile up, and there's certainly room for an improvement in urgency when the tachometer needle's nudging towards the redline. But I find it hard to believe that its fuel economy will get any better because - and I can't believe I'm saying this about a fast Ford engine - our ST is rather frugal. In fact, it has consistently offered over 40mpg during urban driving and, if you stick the cruise control on at 70mph, will happily sip to 57mpg on a motorway run. Yes, you read that right: 57mpg. More than Nic managed to wring from a Golf GTD recently and only very marginally less than the smaller-still 1.0-litre motor on Dafydd's Up GTI. How good's that? No doubt it's partly due to the triple's ability to run on two-cylinders, as well as it's quick-reacting stop/start system, but I also think it's down to availability of that low-down grunt. You simply don't need to ask much from it to match the pace of the traffic. Boring, yes, but it matters at this end of the performance car market. As does a car's usability. This being the three-door, it's not the most practical variant on offer, obviously, and there are most definitely roomier alternatives in the class. But living with our ST for four weeks really has me asking if most of us need any more from a hot hatch. In some ways, the ST has started doing a decent impression of a Golf GTI, being extremely easy to live with day-to-day while entertaining brilliantly when you slip down a couple of gears and take on the twisting tarmac ahead. Heck, I've even missed the Fiesta when I've swapped it for far pricier and more potent machinery in recent days because it's just so easy to get to grips with. Plus, as the cold weather sweeps in, there are few cars under the £25k mark - maybe even the £35k mark - that make waking up at 5am to thick frost so easy to manage. Heated windscreen on, heated seats up to maximum and within a dozen or so seconds your view ahead is clear and backside toasty. Bigger tests are yet to come, of course, but consider the Fiesta well under our skin already. List price new: £21,494 (As tested: £24,515 comprising £745 for Performance Blue paint, £600 for full LED headlights, £475 for blind spot information system, £850 for ST Performance Pack and for £350 B&O premium audio system). Last month at a glance: The ST does the mundane very well - and surprisingly cheaply. Fun car with great economy cake and eat it what's not to like . With the diff for occasional track fun, this does seem to be a great all rounder. I'd still like them to make a fiesta RS though. I genuinely can’t help but read every Ford article as a gushing, unsubtle paid content. Maybe they are making some decent cars? I’ve recently chopped a 330e for a Focus ST and I don’t regret it one jot. It really is fun to drive in a way that the BMW just wasn’t.